....very near two of the largest ridges. 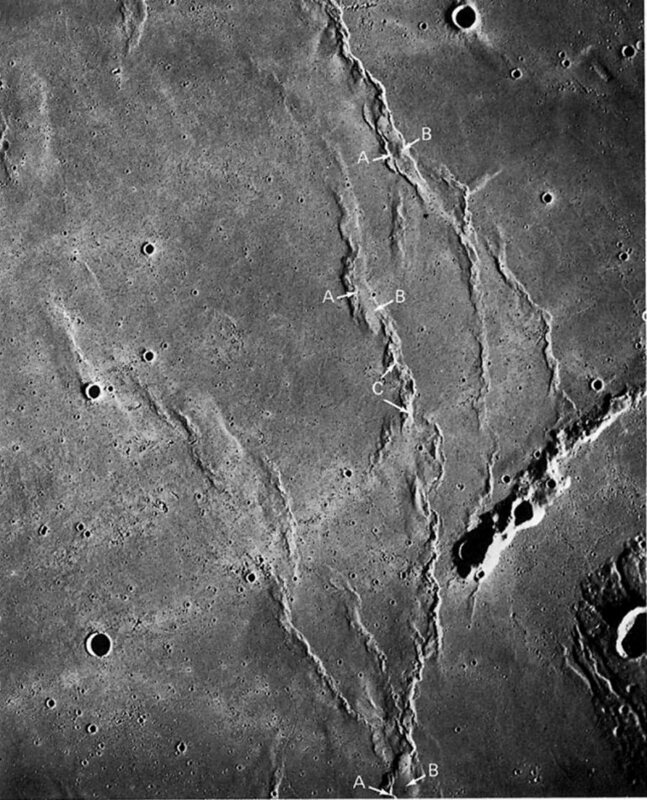 This led Young (Young et al., 1972) to postulate that these rilles are lava channels or tunnels formed during "upwelling and outpouring of lava beneath a thin or viscous crust to form the mare ridges." The large rifle extends southward for 135 km beyond the picture. From the depression at A, a smaller rifle meanders about 100 km northward before disappearing at B. 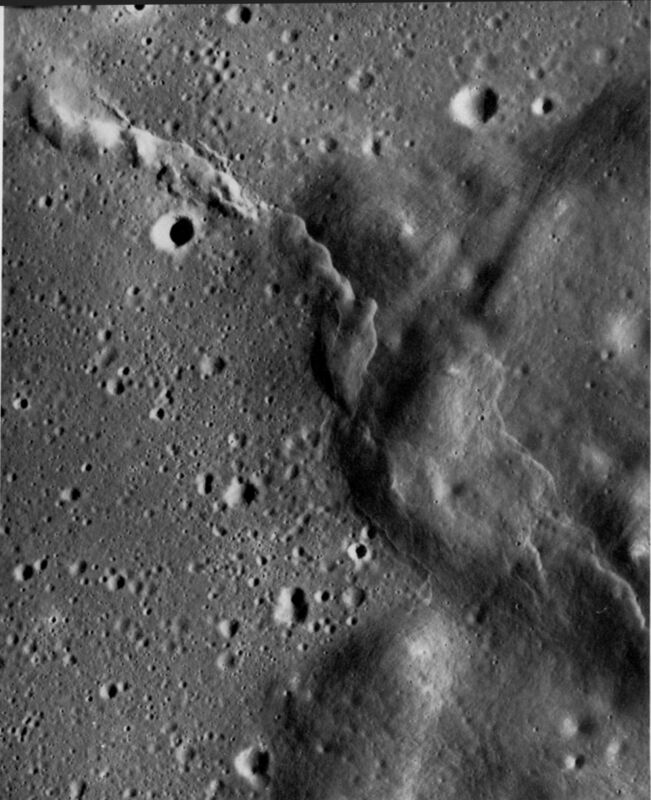 Note that this rifle is interrupted by a small crater (C) and by the two mare ridges at D and E. The crater is obviously younger than the rifle and, almost as certainly, so are the two ridges. Many small sinuous and arcuate rilles, small grabens, and faults are present. 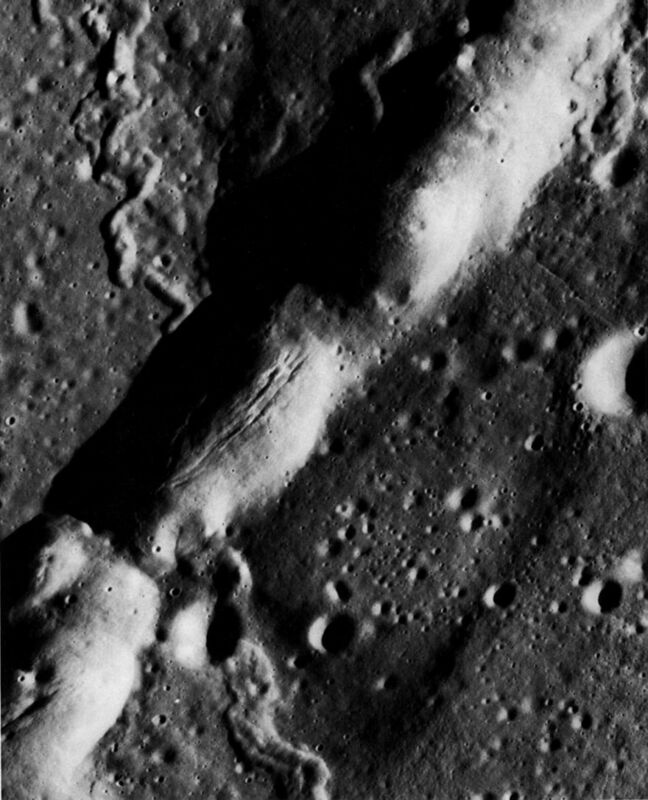 Although it is difficult to distinguish between some of them, most of these linear features are located on or near high areas of terra islands, mare arches, or mare ridges. Also identified on the map are the small possible volcanic domes.-G.W.C. FIGURE 69 [above].-This cluster of features in Mare Cognitum was photographed in color with a handheld camera and 250-mm lens. Its location on a mare ridge is shown in figure 91. 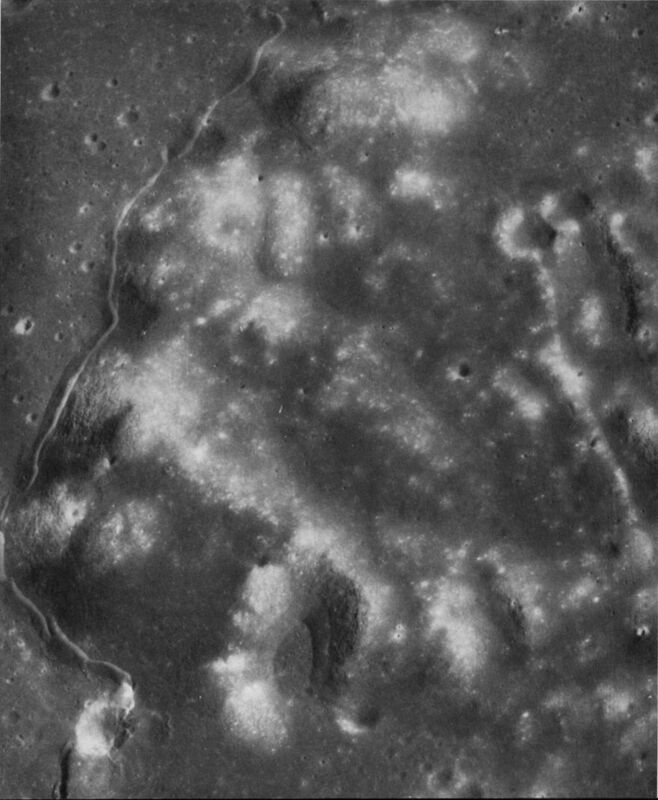 Thomas K. Mattingly, the astronaut who took the picture, noted the taluslike skirt of material around the base of this and many other positive relief areas in the western maria. In this photograph the apparent difference in tone (and in color on the original negative) between the hills and the slightly darker skirt of material around their base is largely, if not entirely, due to differences in slope-a more steeply sloping surface appears brighter, as in the walls of craters in the adjacent mare. However, a real color difference has been found at the base of other prominences. The suggestion has been made that in some mare basins the original level to which lava filled the basin has receded and that skirts such as these are, in effect, "bathtub rings" recording the higher level. The two hills pictured here are probably of volcanic origin.-M.C.M. 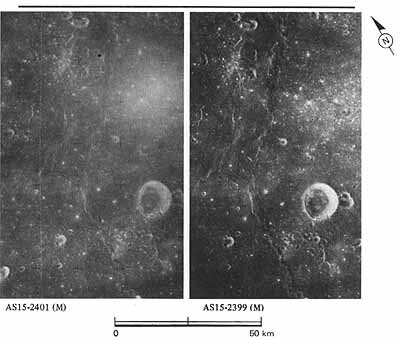 FIGURE 70 [below].-These two pictures were taken of the same mare area near the southeastern edge of Oceanus Procellarum, south and east of the crater Kunowsky. 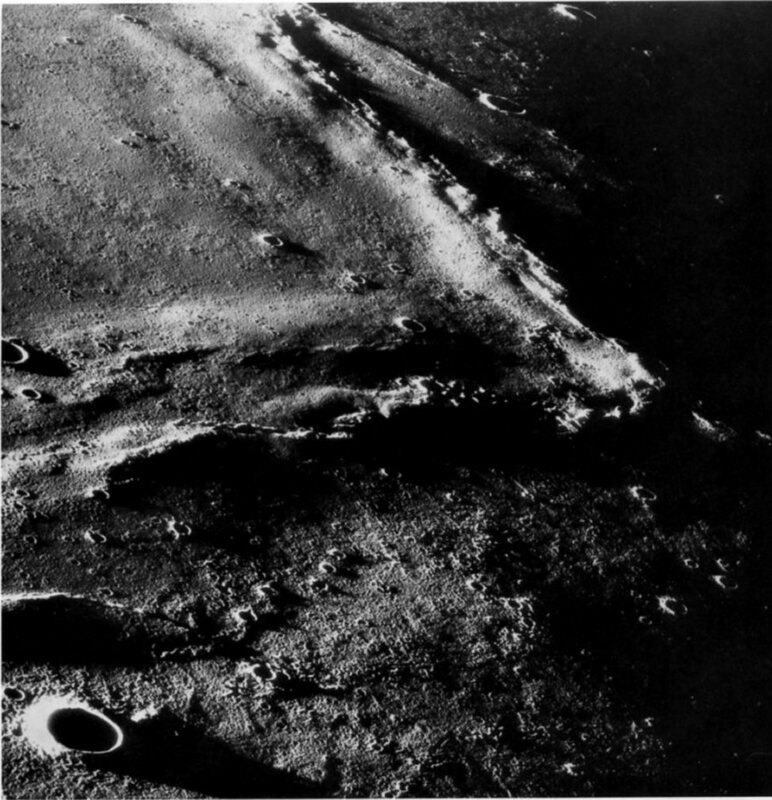 The lower left (facing page [bottom below]) picture is part of a Lunar Orbiter 4 high-resolution photograph taken when the Sun was at a moderate elevation of 18 to 20°. The picture below is a mosaic of Apollo 14 frames taken when the Sun was exceptionally low-0° to 2°. Douglas Lloyd designed the special experiment by which these near-terminator photographs were obtained, using very high-speed film in the Hasselblad camera. 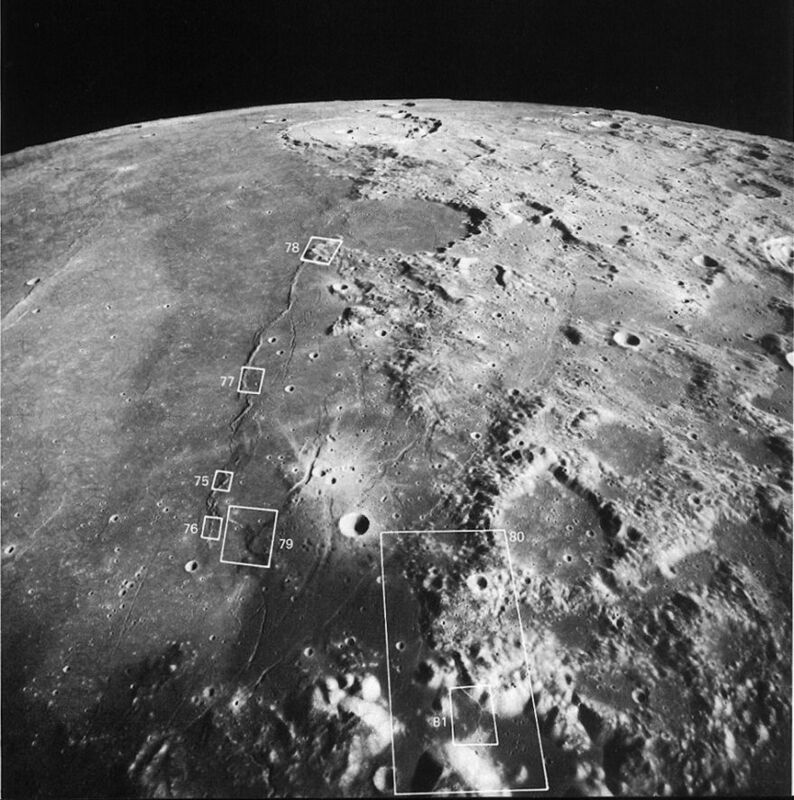 The density of craters (more properly, the number of craters per unit area of surface) has been used by geologists as a tool to determine the relative age of rock units on the Moon's surface. The method has been applied principally in mare areas because crater populations generated on the irregular highland surfaces cannot be accurately measured. These two pictures illustrate some of the problems encountered when applying the method. The number of craters that can be seen and hence counted is affected by the Sun angle. For example, many more craters are visible in the mosaic of low Sun Apollo pictures than in the Lunar Orbiter picture, and a detailed count of all craters in each picture would result in two radically different relative ages for the same area. Further, comparison of the two views shows that the apparent discrepancy in abundance of craters exists only among the very small craters-those a few hundred meters or less in diameter. The number of craters a kilometer or more in diameter is the same in both pictures. The explanation is that most small craters can be recognized as such only by the shadows they cast. The materials on their walls and rims are commonly indistinguishable from those of the surrounding terrain. For each picture there is, depending on the angle of Sun elevation, a threshold value of slope below which no shadow is cast. In the picture at lower left that value has been calculated to be about 5°. 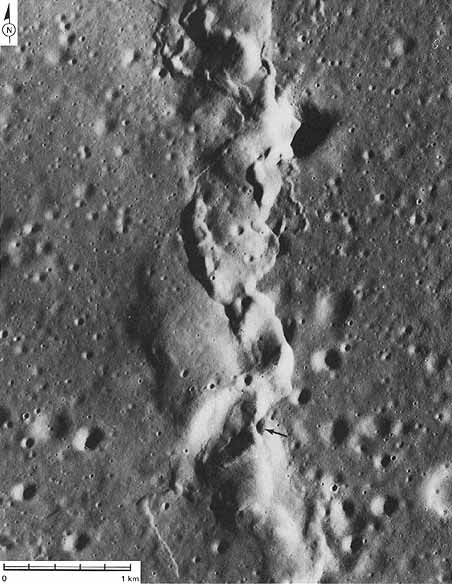 Consequently, those craters that have been degraded so that their slopes are less than 5° are not visible. 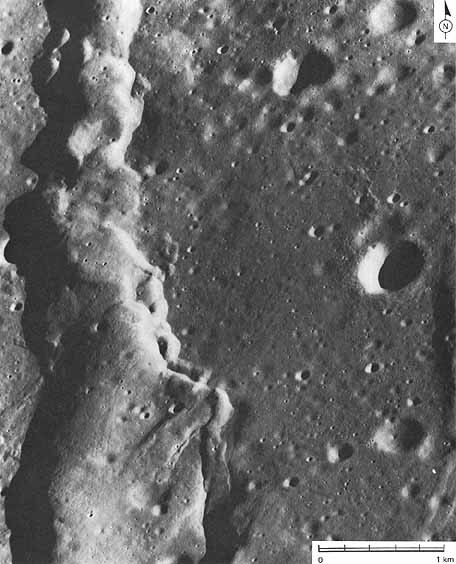 In contrast, craters with slopes as gentle as 0.25° are visible in the picture below. An observation immediately follows. Small craters have a relatively short lifespan. That is, once formed, they are rapidly degraded. Their rims are eroded, and their interiors are filled with debris from the continuing bombardment of the surface by other impacting bodies. By actual count about 80 percent of the small craters in this area have been so degraded that their slopes no longer exceed 5°. It has also been shown (Soderblom and Lebofsky, 1972) that the small crater population here-and in most mare areas-is in a steady state. In other words, the rate of formation of new craters and the rate of destruction of existing craters (either by superposition of other craters, or by gradual erosion by much smaller craters) are balanced. It is fruitless, therefore, to count small craters because such counts will result in the same false age. Fortunately, the crater counting method does yield satisfactory results when applied to larger craters. 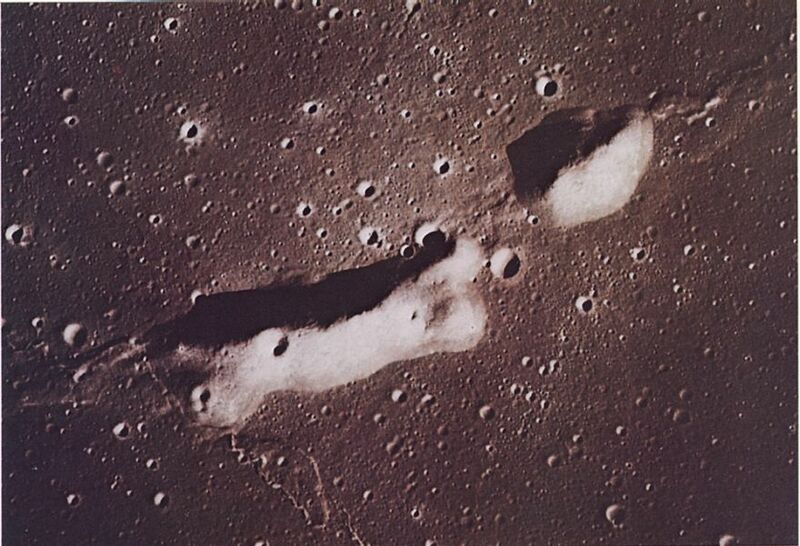 The same number of craters larger than about 1 km is visible in both pictures. This means that no craters this size or larger have been degraded to the extent that their slopes are less than 5°-as were 80 percent of the small craters. 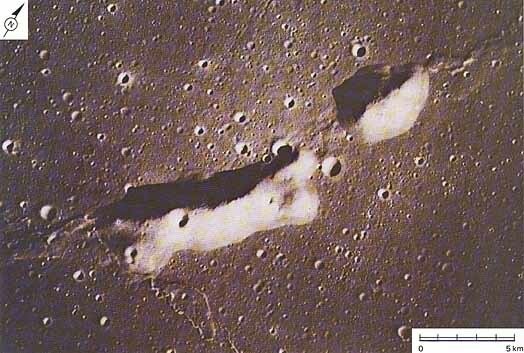 We may assume then that all the larger impact craters that ever formed on the upper part of the mare surface have been retained and that their relative abundances in different areas are a measure of the relative age of those areas. With the careful application of this method, it has been possible to assign relative ages to most of the mare areas of the Moon. Using the absolute ages that have been determined for samples returned from the Apollo landing sites in the maria (Apollos 11, 12, 15, and 17), the relative time scale now has a quantitative base so that relative ages can be converted to absolute ages.-L.A.S. 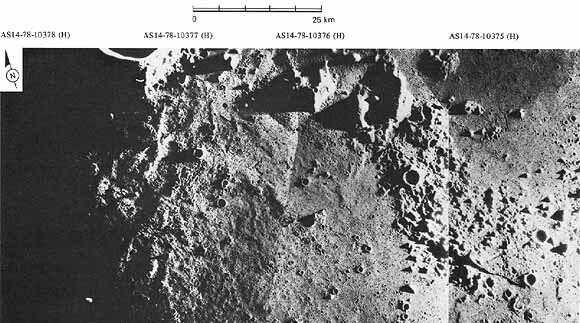 FIGURE 71 [above].- A very low Sun angle emphasizes detail in this south-looking oblique view of an area in western Oceanus Procellarum. The crater Seleucus is just outside the field of view to the right, and Seleucus E is in the lower left corner. The near-terminator view was exposed in a hand-held Hasselblad camera with a 250-mm lens. Low Sun illumination enhances small surface features and subtle differences in slope so that the broad, gently sloping arches associated with the mare ridges are clearly delineated. The oblique viewing angle accentuates the angularity that characterizes the path of many ridges as they are traced across the mare surface. (See, for example, fig.68.) - M.C.M. 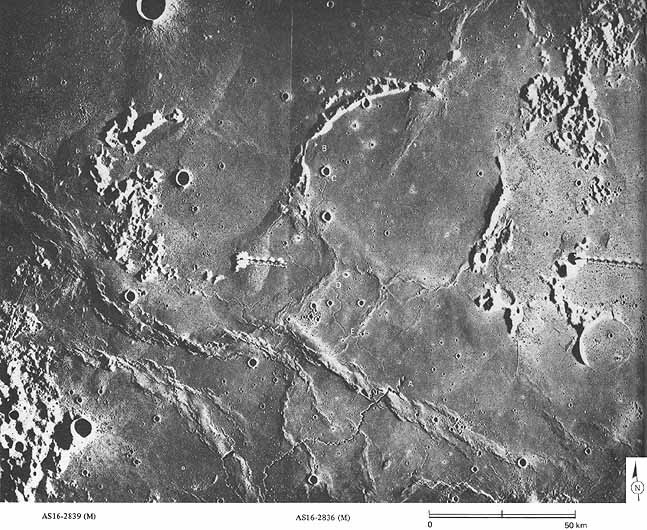 FIGURE 72 [right].-Mare ridges in Oceanus Procellarum at the northwest tip of the Aristarchus plateau (lower right) are typical of mare ridges in many other areas. Among these are small crenulate wrinkle ridges (A) superposed on broad gentle arches (B), braided or en echelon patterns, a common tendency toward parallelism within limited areas, and a tendency to be deflected by obstacles such as the arcuate ridge belt of terra near the Aristarchus plateau. Measurements by photogrammetric methods have shown that mare ridges may project as much as 250 m (at C) above the surrounding mare surface. The origin of the ridges has yet to be explained satisfactorily by any single hypothesis. Among those proposed are (1) intrusion of deep-seated, postmare dikes and laccoliths, with some extrusion; (2) compressional buckling caused by sagging of comical mare surfaces; (3) buckling at the fronts of lava flows; (4) autointrusion of molten subcrustal mare lava forming laccoliths and squeeze-ups; (5) thrust faulting; and (6) drag folding along deep-seated transcurrent faults. The diversity in morphologies and patterns of ridges suggests that several hypotheses may be required to explain all of them.-C.A.H. 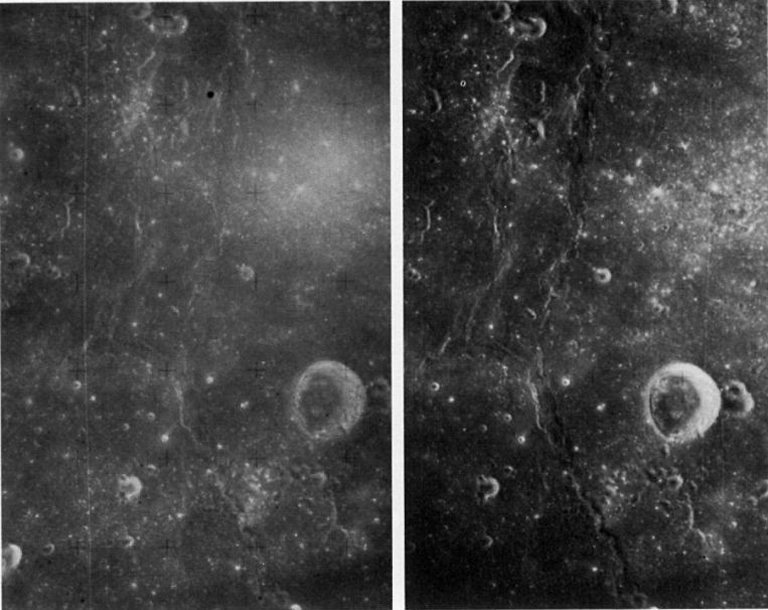 FIGURE 73 [right].-Stereoscopic viewing, made possible by the overlap of Apollo mapping camera frames, does wonders for some lunar scenes. 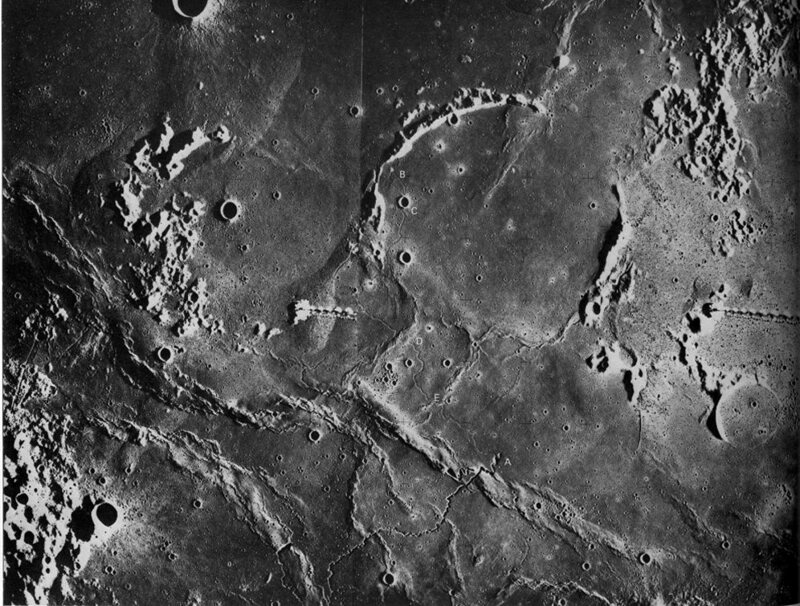 When viewed monoscopically, these photos taken at high Sun illumination in Mare Fecunditatis show bright patterns of craters and narrow mare ridges. Viewed stereoscopically, they reveal the relative depths of the craters; the sharp relief of the narrow ridges; an unsuspected broad, high swell between the parallel "ranges" of narrow ridges; and the even more surprising differences in elevation between mare surfaces in the left (west) and right parts of the photograph. 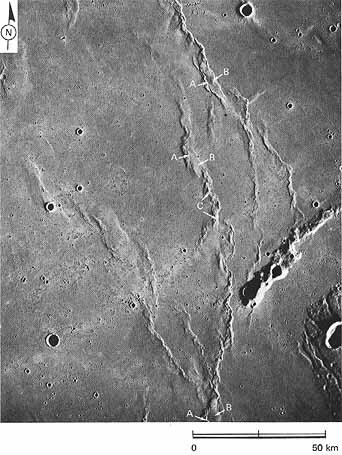 The elevations of the mare surfaces probably mimic the variable depth of the buried floor of the Fecunditatis basin. The center of the basin, presumably the deepest part, is located near the left of the picture, where the mare surface is lowest. The large crater Messier G is 14 km in diameter.-D.E.W. 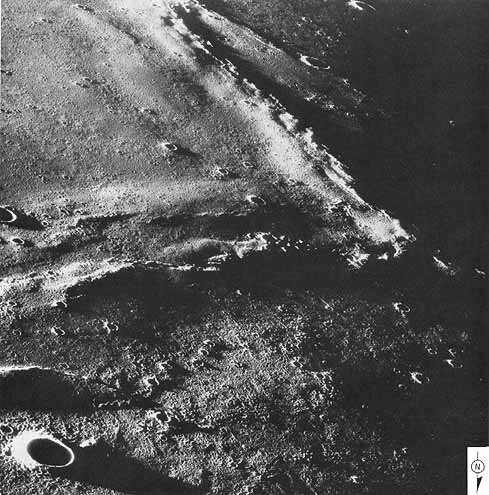 FIGURE 74 [above].- An oblique view looking northward along the east side of Mare Serenitatis. 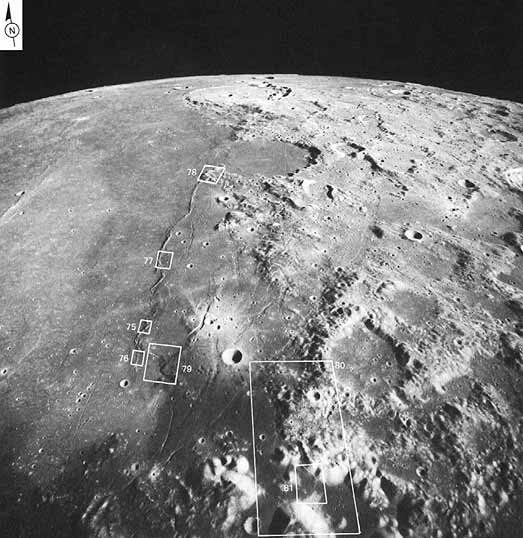 The Apollo 17 landing site (arrow) is near the lower edge. 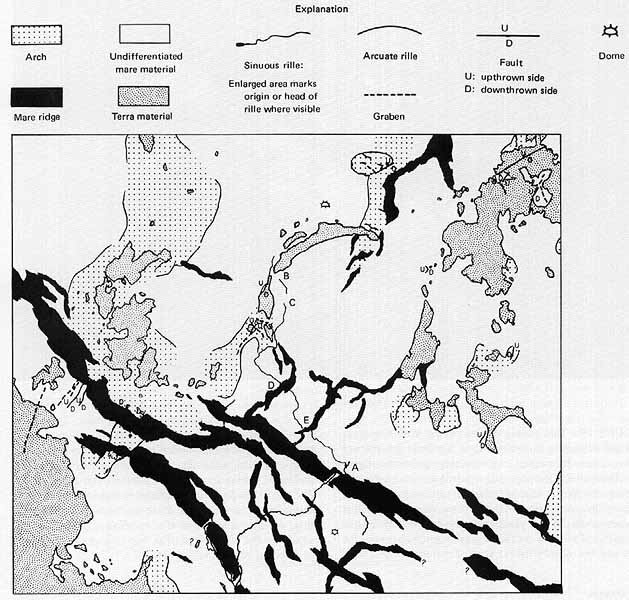 A nearly identical view was used earlier (fig.27), so the geology of the area will not be discussed again. 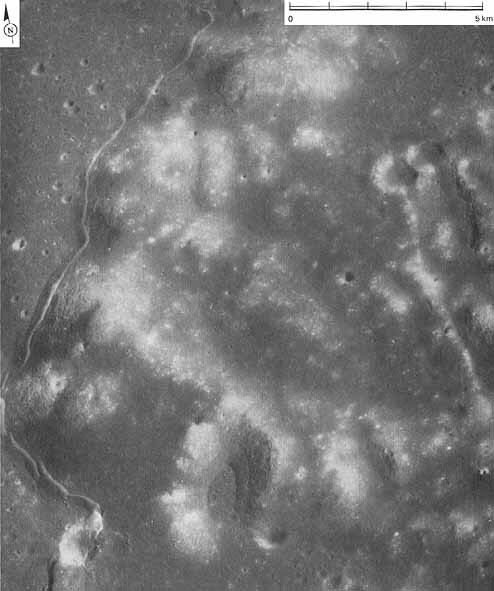 We have included this picture here to serve as an index map for the next seven pictures, which are detailed views of parts of the Mare ridges visible in this photograph. -G.W.C. FIGURE 75 [above].- This and the next six pictures are enlargements of specific areas to show the detailed form of the mare ridges seen at much smaller scale in figure 74. Here can be seen a small segment of the most prominent ridge enlarged about 45 times. When seen in detail, the ridge is spectacularly crisp and well formed. The main ridge here is shaped like a string of sausages. Smaller wormy ridges appear on either side. Cracks in the top of the ridge probably formed by buckling of the mare lavas. As the following figure show, most other parts of the ridge are less symmetrical than this part.- K.A.H. FIGURE 76 [above].-This part of the ridge appears to have flowed over the ground to the right. A careful search will reveal several craters overridden by the ridge along its right edge. 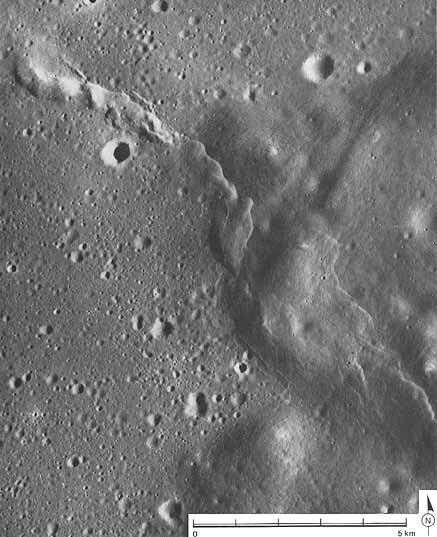 A large oblong crater on the ridge near the bottom of the photograph has evidently been distorted by the ridge; in fact, the right edge of the crater seems to be cut off. (See arrow.) One can imagine that a sheet of soft putty might form a similar ridge if it were thrust over to the right. Model experiments and observations of deformed rocks on Earth have shown that large masses of rocks, even hard rocks like basalt, can behave like putty over sufficiently long intervals of time.-K.A.H. FIGURE 77 [below].- Here again the ridge has overridden craters along its right side. 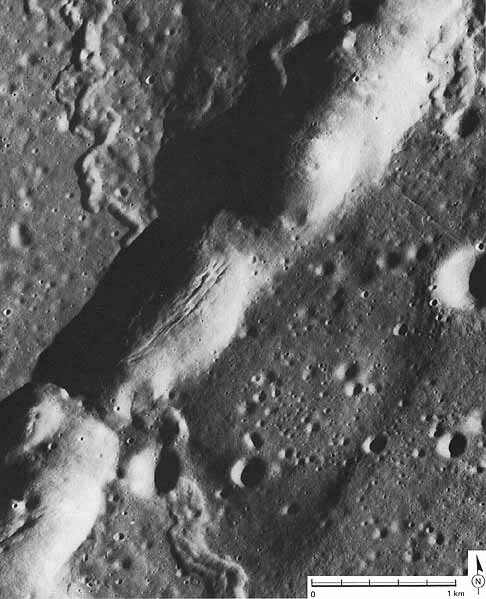 Many other mare ridges that are older may once have looked like this. The freshest examples of lunar features, like this one, are the best places to look for hints on origin. - K.A.H. FIGURE 78 [below].- At its north end of the ridge becomes a scarp that wraps around the base of the highlands like a shoved rug. Were the mare lavas thrust against the highlands? This might seem easiest to imagine if the lavas had been only partly solidified when they were deformed, but the lavas had had plenty of time to solidify. 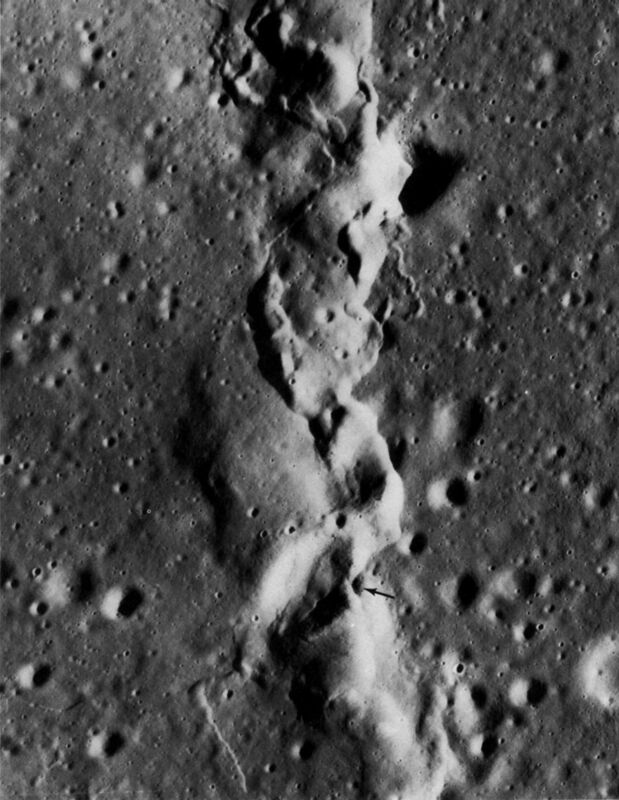 The ridge deforms numerous impact craters, such as the one near the bottom of the photograph. A long time-probably hundreds of millions of years- had to pass for these impact craters to form after the lavas crusted over and before the ridge formed.- K.A.H. 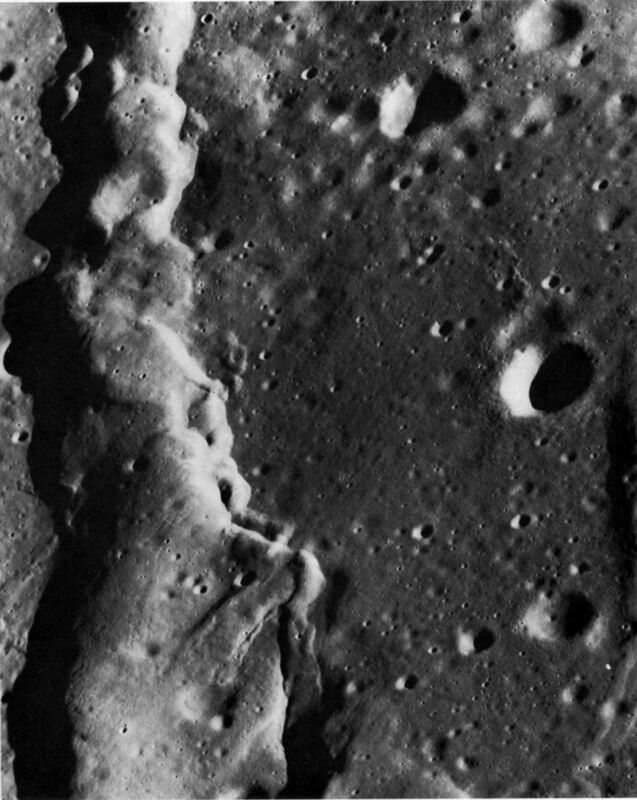 FIGURE 79 [above].-In the upper left corner of the photograph, a lunar ridge heads in a southeasterly direction toward the dark mantling unit that rings Mare Serenitatis. At its south end, one branch of the same ridge disappears in the dark mantling unit. The ridge boundaries are crisp and clear in the lighter mare materials in the left half of the photograph. However, in the much darker and topographically higher unit to the right, the ridge is subdued. (Owing to especially favorable lighting conditions, the true height of the east-facing scarp of the ridge is exaggerated.) The sequence of events worked out from the study of this area is as follows: (1) the Serenitatis basin was probably formed by the impact of a giant meteoroid; (2) the rim materials, and perhaps also the inner part of the basin, were flooded by dark basaltic lavas and associated volcanic (pyroclastic) debris; (3) the central part of the basin was filled by a lighter colored basaltic unit; and (4) gravitational adjustments to the enormous mass of volcanic fill probably caused the formation of the ridges in the light mare in the inner part of the basin and locally in the dark outer ring.-F.E.-B.